The Epic Phantasy RPG with Award-Winning stunning graphics is now open to the Global Audience! Get ready to greet a bunch of infamous Phantoms from myths & legends around the globe! Explore the world of Phantom Chaser and lead your team to victory against the evil force once and for all! ★ Over 130+ Phantoms to collect and master! Possess your character with Phantoms to absorb its abilities and unleash powerful skills. Strategical use of Mimic can turn the wave of battle. ★ Configure your team wisely! All characters are divided into 3 roles; Melee, Mid-Range, and Long-Range. ★ Manual Control for a more Strategic play! Control the position of your team members to avoid or reduce damage from enemy attack. Focus fire on a single target to eliminate present threat! Acquire Phantoms through playing stages, summoning and also CRAFTING! Level Up, Upgrade, Transcend and Evolve your Phantoms to unlock potential powers. Watch your Phantoms change in appearance as they become Stronger! ★ Put your team to the test in Arena! Battle it out with other ‘Phantom Chasers’ from around the world. Climb up in the Ranks to receive a worthy reward for the effort. 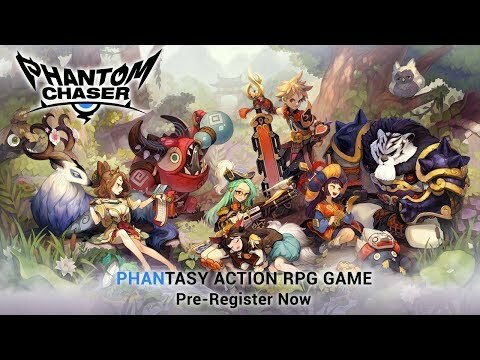 Prepare for an Epic Journey into the world of Phantom Chaser! US, CA, UK, DE, FR, AU, TW, HK, SG, VN, MY, MO & etc. 10 summon code is used? Apologies for the late reply. Please submit your inquiry to cs@glo-how.com for further support. Indicate your IGN / Server / Code that you received in the details please.